The PROFIL is used to monitor subsurface deformations of the ground in landslides, embankments and dams, and around deep excavations and tunnels. 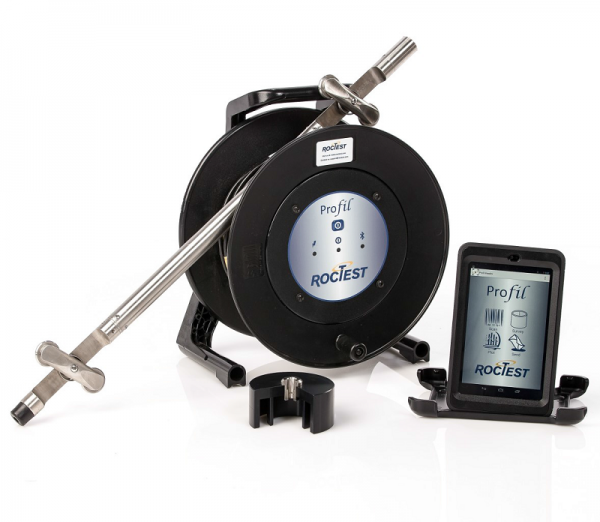 The PROFIL system includes a digital probe, lightweight control cable, Bluetooth reel, cable gate, Profil Reader app, and Profil Manager software. The standard system includes a detachable probe. A system where the probe and the cable are permanently attached is available in option. The Profil’s major advantages are its sensor technology and mobile computing which bring simplicity to survey operations. To start a survey, tap an inclinometer borehole from the list displayed by the Reader. Alternatively, simply scan the QR code that is fixed to the casing. At each survey depth, the Reader prompts when a stable reading is ready to record. To record, simply pull the cable upwards to the next depth. The Reader senses motion and stores the stable reading in non-volatile memory. There is no need to hold the Reader or tap a button. Your hands stay free to work with cable and probe.If the survey is interrupted for any reason, simply tap to resume at the same depth, with no loss of data. When the survey is complete, plot checksums, profiles, and changes to validate the readings before you leave the site. Afterwards, send surveys to the office via the Internet, using email with automatic file attachments or Dropbox for full synchronization. If the Internet is not available, use a USB cable for data transfers. Graduations are measured from top wheels of probe. Metric cables have 0.5-m graduations with numeric depth labels every meter. 30, 50, 75, 100 m / 100, 150, 200, 300’. Other lengths available. Every control cable is 3 m (10 feet) longer than its listed length. The four-conductor cable has a Kevlar strain membrane, and polyurethane jacket. Index Point: Cable gate aligns graduation with top of casing. Casing Compatibility: Fits 85, 70, and 48-mm casing (3.34, 2.75, and 1.9-inch casing). Cable gate aligns graduation with top of casing. OS: Android 4.0 and above. Number of inclinometers and surveys are limited only by device memory. Maximum depth is 300 m / 1000 ft. Depth intervals are multiples of 0.5 m or 2 ft.
Survey Screen: Large, readable characters. Shows active depth, last depth recorded, A and B readings in mm, inches, or classic units, checksums, and progress bar. Record button prompts user to wait, tap, or pull (in hands-free mode). Plots checksums, profiles, change-from-initial, and change-from-last in high resolution. Displays data table for inspection and survey-time corrections. Send: Transfers files from the Reader via Internet connection. Modified files (new surveys) are automatically attached to an email. Dropbox transfers are more automated, requiring no action at the destination. Controls: On/Off switch, LEDs for power, charge state, and Bluetooth. Timed auto-off. Power: Internal battery provides 40 hours of operation. Charge time is about 5 hours. The system includes a digital probe, lightweight control cable, Bluetooth reel with international AC adaptor, cable gate, Profil Reader app and Profil Manager software (to be downloaded). Reader device is not included and must be ordered separately. Easy to carry and easy to handle, detachable probe and lightweight control cable featuring numeric depth labels at every other graduation. 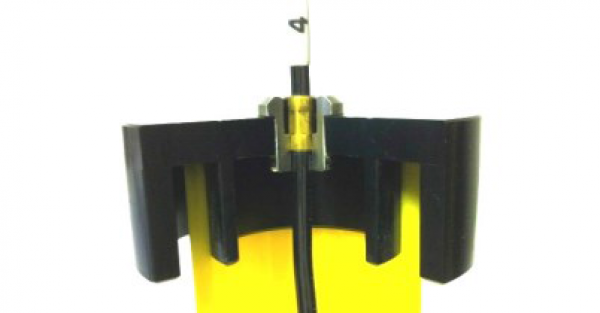 Compatible with most common sizes of casing, the compact cable gate aligns cable graduations precisely at the top of the casing, eliminating the potential for depth errors if the cable gate is forgotten. Android supports high-resolution screens, touch-screen interfaces, and full Internet connectivity. The Profil Manager software stores data from the Profil system in a database, and generates graphs.